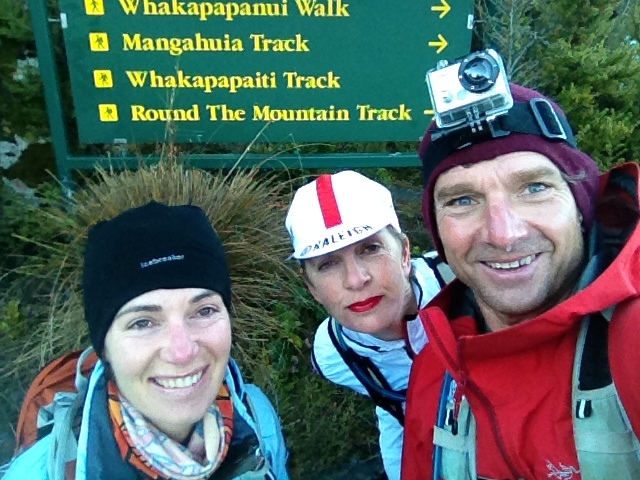 The text arrived as I was driving out to the Waitakeres to attempt my PB on the Hillary Trail last weekend. I was focused on other things but still it got me excited. It came from my good friend Barb McCarthy (she of Bright Red Lispstick fame) and read “lodge next to Chateau booked next weekend for Round The Mountain. Drive Friday arvo, run Sat. Bed available if you want to join us”. 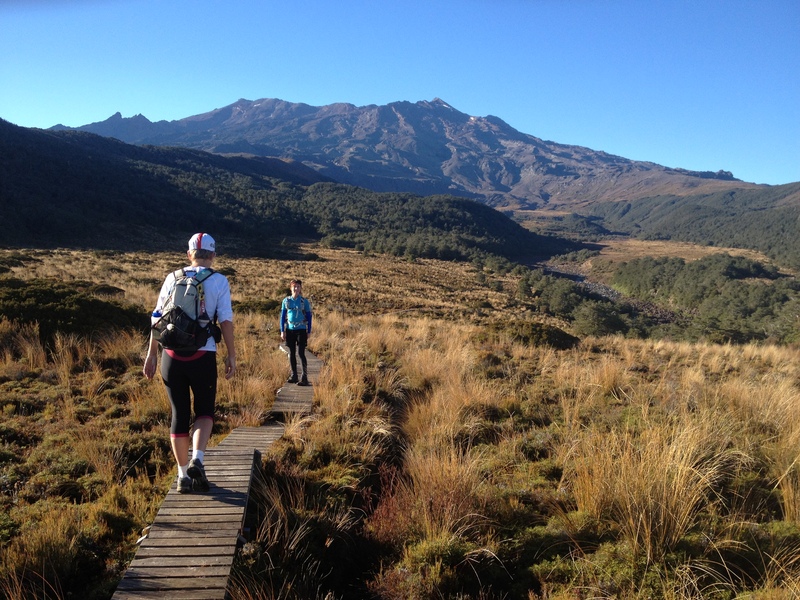 The Round The Mountain (RTM) track circumnavigates the North Island’s highest peak, the mighty Mount Ruapehu (2,797m) and is billed as a 4-6 day walk. It has been very high on my ‘to do’ list for a long time. I’ve run sections of it before but there was a big chunk of unexplored terrain in the middle. I’ve always considered it to be one of New Zealand’s classic long trail running missions and my first attempt at it was long overdue. If my love of new adventures hadn’t been enough to instantly say “yes” then my FOMO (Fear Of Missing Out) most definitely would have made the decision for me. I texted straight back “count me in”. 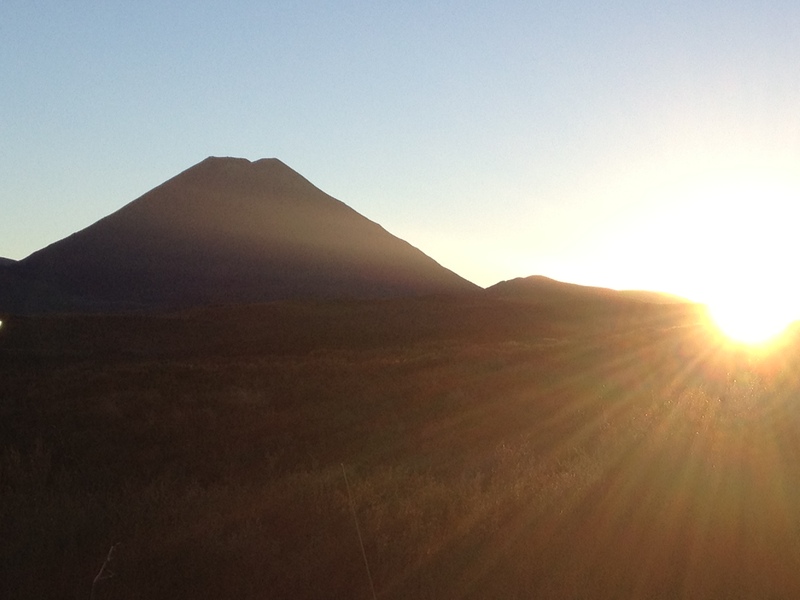 7am Saturday morning and the sun sneaks its way over the shoulder of Nguaruhoe. It’s going to be a beautiful day. Excited we don our heavy packs full of tasty trail food and the back-up kit that’s needed when heading out on a major mission like this. The day started a little crisp and there’s a bit of frost lingering here and there on the trail, but very soon we are stopping to strip off layers. We can’t believe our luck to be in such a beautiful place on such a pristine autumn day. We’re taking the long route, following the Whakapapaiti Track to avoid a 5km ascent on road to the official start. Bitumen is boring and so say all of us. A good decision because it’s a stunner, especially in the low light of morning that has the tussocks burning a fiery hue of rust. The legs feel slow to get going, perhaps still feeling the effects of that sub-12hr Hillary Trail run just 8 days prior. But none of that matters because there’s no big rush today. Within a couple of hours we reach the first hut and shortly after turn right to join the course of The Goat race. I’ve only done this section once before, in the opposite direction in heavy rain during the Mizone Endurazone length of NZ multisport race back in 2001. Today it all feels brand new as there’s not a cloud in the sky and we have time to lift our eyes from the technically demanding trail at least once in a while. It’s no wonder The Goat is now a sell-out race every year, this is an unparalleled mountain running experience. Mt. Taranaki comes into view, crisp & clear on the skyline more than 100 kms away. My heart sings and my legs feel a little lighter. This is unbelievably brilliant. 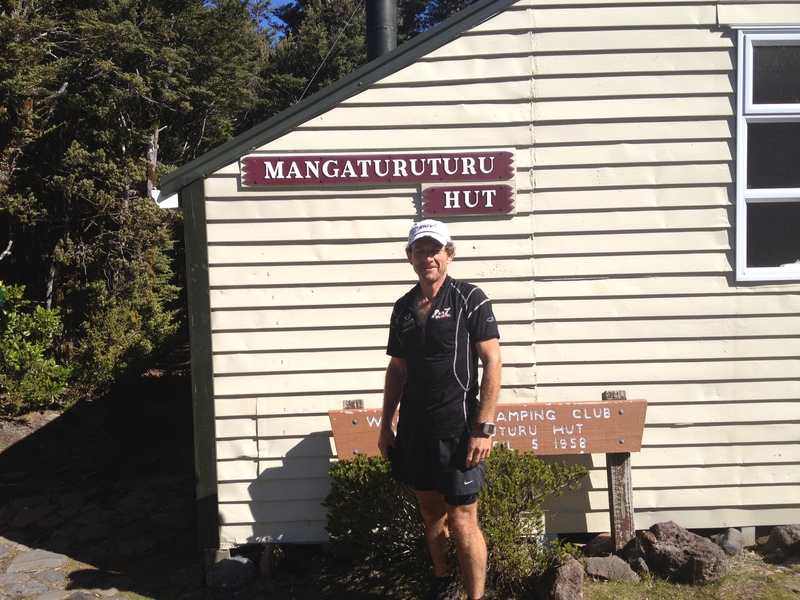 We’re now traversing the western flanks of the mountain, climbing in and out of a few deep gouges in an elemental landscape, crossing several creeks before dropping to Lake Surprise and a spectacular section of steps/boardwalk leading to the ridiculously quaint Mangaturuturu Hut. While the girls attend to their ablutions I make a mental note to return here for a night with a good book and a bottle of something red and fermented. From the hut we climb towards the base of the Cascades where the clear cold waters flowing off the Mangaehuehu Glacier tumble spectacularly over a steep rock wall. It’s a steep climb but we’re loving every moment of it. 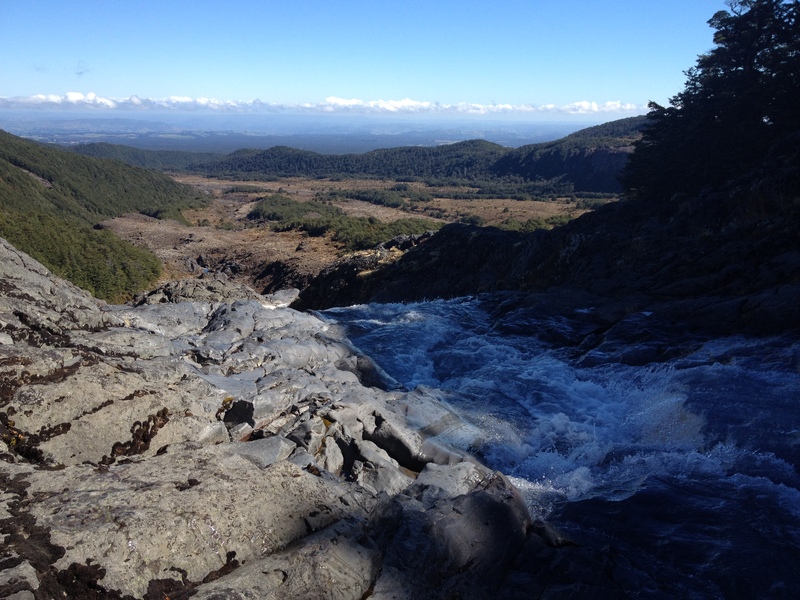 One more descent and climb brings us out on to the Ohakune Mountain Road. We head downhill and knock off the 2 kms of sealed road as quickly as we can, stuffing in food as we go. Turning left we start tracking around the southern side of the mountain and an endless series of small ups and downs and creek crossings. I’m relying on one 600ml bottle at this stage and loving the refreshing taste of the cool mountain elixir that is in no short supply. 7 1/2 hrs into the run we reach what we believe to be the half way point and know that ahead lies the toughest section of the whole day. It’s only much later that we discover we have under-estimated the length of the run by 10 kms so we were still way short of ‘the hump’. It’s probably just as well we didn’t know this as we headed off into the bare, lava-strewn rocky expanses of the Rangipo Desert, mindful that we wanted to break the back of this technically challenging, physically brutal section before nightfall. The weather was holding, the views up to Girdlestone Peak and down to the Desert Road are invigorating but there’s no denying that we’re starting to feel a little weary. At least Vicky and I are. Barb just keeps doing her Energizer Bunny impersonation. 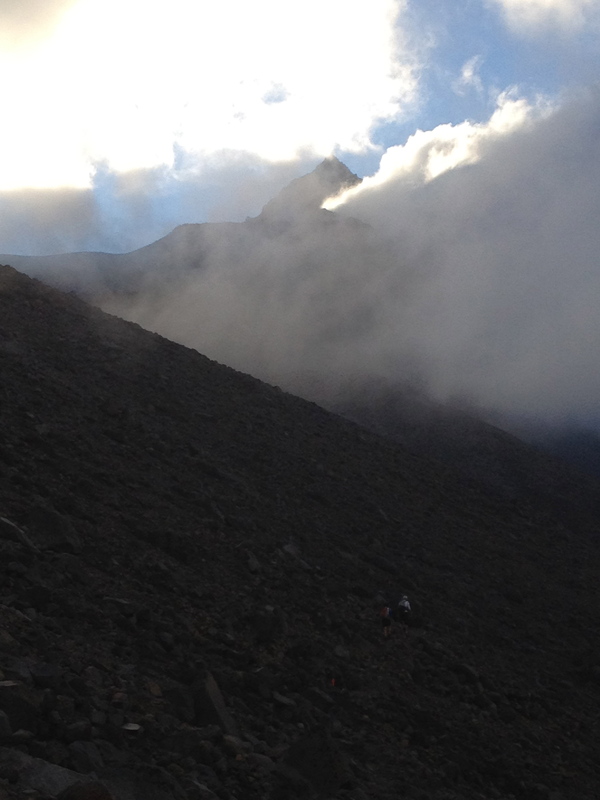 Three hours later we reach Rangipo Hut just on dusk. We’re envious of the family staying there for the night all tucked in next to a cosy fire with warm food inside them. We set our sights to the north and turn on our head torches. It’s time to engage the ‘top two inches’ and grind out the blind kilometers, stride by ever-shorter stride. This is a pretty wild place to be at night. The ‘trail’ makes its way over bare rock and shattered lava and we’re finding our way by following the reflective strip on top of the snow poles. Picking the poles out in the dark is challenging and some have blown over. So we regularly stop and scan ahead, straining to pick up the next marker. But overhead the sky is a mass of stars. From time to time we turn out our lights and just stare in awe at the heavens. Running at night is so cool! The Tukino Road takes an impossibly long time to reach but when we finally get there we celebrate with a miniature peanut slab each and with no further ado plunge into the dark, heading down treacherous terrain towards the Mangatoetoenui Stream and the spectacular bridge that traverses it. Even in the dark we’re aware of just how stunning this is but again I make a mental note to come back and see it by daylight. We’ve now been going for well over 12 hours and our bodies are weary. Even the Energizer Bunny is running a little low on juice and we take it turns to rally one another with helpful comments like “stop your whinging and get on with it you big girls blouse”. It’s at times like this that the camaraderie of the trail builds to special heights. All three of us are glad we’re not alone out here. Unlike the solo American runner who we then come across. He set off a good hour before us. We’d had word from trampers that he was out there ahead of us somewhere but we’d never expected to catch him. So with what we thought was about 10 kms to go (actually, it was to be 20 kms) we swept up Brian from Alaska and added him to our bedraggled and tired bunch. I guess we provided some kind of cheer for him although by now we weren’t really talking much. We were just keeping our heads down and relentlessly notching up the miles. Eventually, some 16 hours into our jaunt, we saw the lights of the Chateau in the distance. They looked depressingly far away. This was because they were…. well, still quite far away! It took the best part of another hour on hard-packed trail (too much new gravel DOC!) before we burst out to the road end, grateful that it was over but buzzing from a brilliant and epic day out in a very special place. 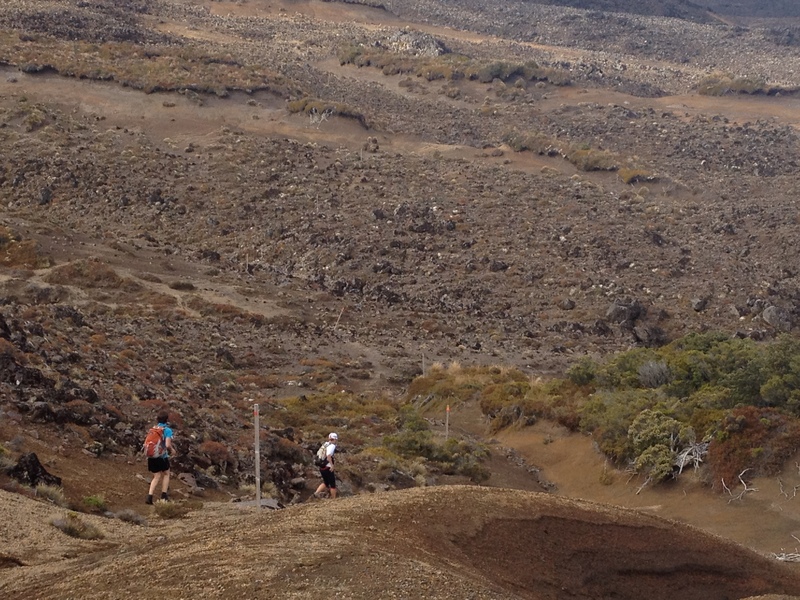 This entry was posted in Great runs and tagged New Zealand, Round The Mountain, Ruapehu, running, Tongariro National Park, trail running, ultra running. Bookmark the permalink. Nice, great reading and cool to see the garmin data. Where is the goPro film at? !